When it came to concerts in Tsukuba this year, the people in charge of programming along with the agents- perhaps even the Gods of music themselves- arranged it so that the best was saved for last. And though some of you might play devil`s advocate and charge me with most strongly remembering the MOST RECENT concerts of the year- I stress with confidence that even if I had seen these two particular shows at the beginning of the year – the Goldberg Variations performed by string trio (Imai, Cabeza and Cabezas) and the singing of the Irish vocal ensemble Anuna were the musical highlights in Tsukuba of 2014. Let me tell you a little about these two great experiences. 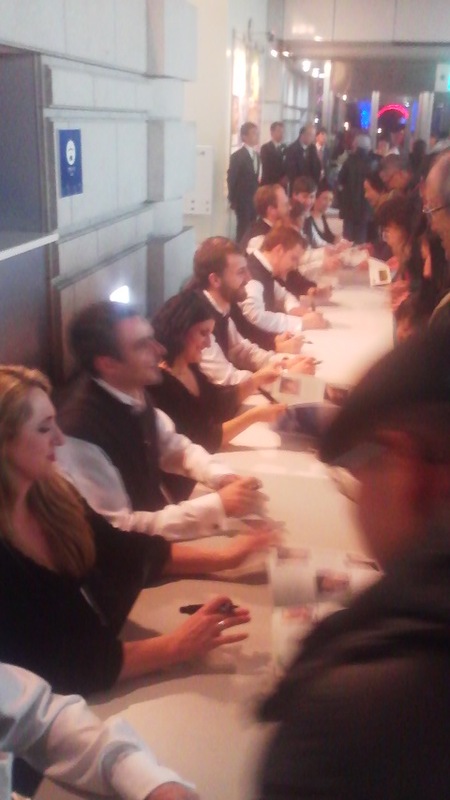 This was more than just great music and musicianship- it was a homecoming ! And a long anticipated one, at that. It was exactly 20 years ago, that a baby girl was born in Tsukuba. Her parents were not only dear friends of mine, but core members of the Tsukuba foreign community of the time (the little apartment they lived in near Coco`s on Higashi Odori was the scene of some of Tsukuba`s best parties ever- and passing by the now run-down place at night I sometimes here the strains of salsa or the tango- and smell the MATTE tea being passed around. They should put a commerorative plaque on in front of the building!). Soon, her father had to leave Tsukuba to further his studies- and they moved to Nara (where I would go stay with them 2 or 3 times a month- spending lots of time playing with their daughter!). But alas they moved yet further away- this time to Canada, and then on to the United States, and it was painful to lose these special friends, who had really become like family to me in Japan. But after a few years I heard of an exciting development- their daughter Maia apparently had a special knack for music- in fact it was much more than a knack- she was a true PRODIGY who went on to study at the Curtis Institute (one of the finest music schools in the world) at the of age 12. In fact, just before she went off Curtis my parents and I drove down from New York City to Raleigh North Carolina to hear Maia play as the violin soloist for Ravel`s Tzigane. No one who was there that day can forget how that unsupposing, even scrawny little thing standing on stage suddenly turned into, burst into a pillar of perfectly intensity and passion when it came her time to play. It was simply jaw-dropping. 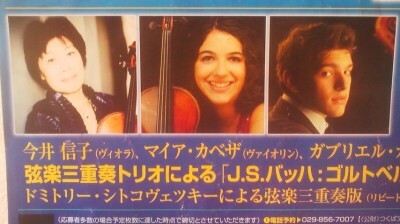 Since then she has gone on to win the International Mozart Violin Competition and to play with world class orchestras. She is currently living in Berlin. This year I got an email informing me that Maia would be coming to Japan- and this time she would have a concert date in Tsukuba. Maia was finally coming home. And she would be playing on a stage at Nova Hall upon which many of us vividly remembering her mother standing on for her own flute recitals. I soon realized though that the excitement regarding Maia`s arrival would run even deeper for me when I read about the program. Maia would be playing with Nobuko Imai – one of the great viola players in the world, and someone I have been listening to (on CD) for decades. 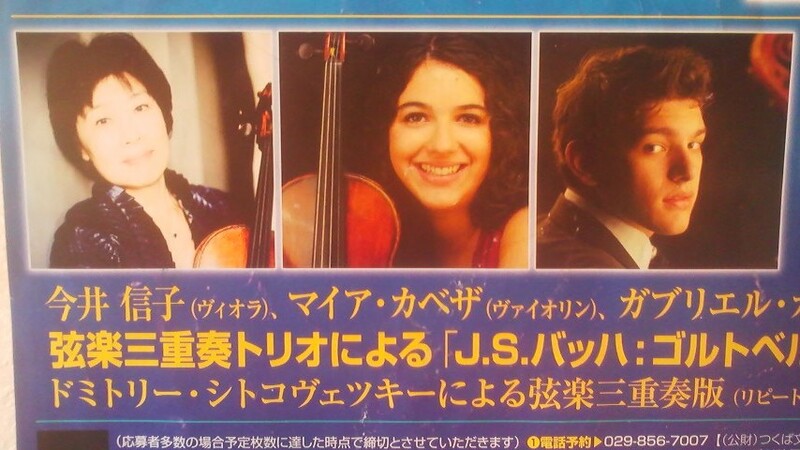 In fact, I remember years ago listening to Imai-san`s viola playing on Berlioz` Harold in Italy – with Maia`s parents. We were all amazed by the tone colors and textures she could conjure up on her instrument.. 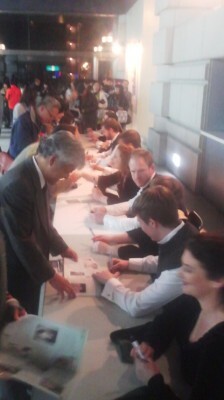 Afterwards I could speak with Maia. who showed no signs of the exhaustion she must have been feeling, and she took me backstage to meet Nobuko Imai. My heart was racing as the brilliant, charismatic,brilliant ageless (looking 30 years younger than her age) musician let me shake her hand and chat with her for minutes. I decided never to wash that hand again! And then they were gone- off to Tokyo and then back to Europe. Lets hope we don`t have to wait very long before Maia comes back to her HOMETOWN- Tsukuba, Again! Anuna is a mixed choir from Ireland singing songs in Gaelic, Latin, English- and Japanese! For as long a sI can remember I have loved Irish music. My parents 1960`s folkies used to listen to the Clancy Brothers, the Chieftains and others on our old record player- and the songs of sorrow, exile, and rebellion became a part of our family culture. Even now, there is no other country`s songs which can so consistantly CHOKE ME UP. Later I hosted an Irish radio show at my college station (WHRW) and preparing for it each week really helped me deepen my knowldege of Irish and Celtic Music – I had advanced far beyond the Clancy Brothers! I played (and often met for interviews) the likes of Andy Irvine, Donal Lunny and Christy Moore of Planxty,Kevin Burke, the Bothy Band and Clannad. That was along time ago, but the music has always stuck with me. 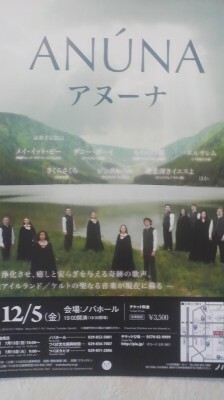 It is only to be expected then that I would want to go to a concert in Tsukuba which featured a chorus from Ireland who sang in several languages. th only thing was, since I had never heard of ANUNA, I had no idea what to expect, and I went to the concert with the attitude that I had better not expect much. Right from the first notes, however, I relaized that I was having one of the great SOUND experiences of my entire life. I had taken my front row seats in the disappointingly half-empty auditorium. Candles burned on stage. When the lights went down, one of the singers, a woman, approached the stage from the back of the theater, she held a candle, cupped with tow hands, beneath her chest. The voice she let out was pure and penetrating. It sent chills down my spine. She was soon joined by other harmonizing lines sung by others members of ANUNA who were moving around us in the auditorium. This created a special sensation, with sounds, tones and harmonies shifting in balance and effect on the ear as the singers moved about the room. They then went on to perform a range of songs- in Gaelic, Latin, English, and even Japanese ( their rendition of the theme from Princess Monoke was better than the original !) They sustained a level of audience interest much higher than you would imagine in a group all dresses in black holding candles beneath their chests throughout- it was as if they were making a point of NOT being the flashy Riverdance show which has been such a world-wide phenomenon. I was in fact suprised to later find out (after a google search ) that ANUNA had worked with Riverdance from 1994-1996! DO a utube search for ANUNAS and check out what you can find online- you will quickly realize good this group is. But you cannot be satisfied that you have heard ANUNA until you have heard them LIVE- it is truly a unique sensation to the ear. I hope with all my heart that they will come back to Tsukuba – despite there having been such an embarrasingly poor turn-out for their show on the 5th. Who knew they would be so good ! (One piece of advice I would offer ANUNA for when they come to Japan next would be to consult with their interpreter BEFORE the show about what was going to be said- or to even give up an interpreter at all. The woman they had at Nova Hall really had a hard time of it- For example she said such things as: Japan had only a peripheral role in the war of 1940 (instead of 1914), and when ANUNA leader Michael McGlynn wanted to get a laugh by introducing the Japanese classic Sakura Sakura by saying ” This next song is very special”. the interpreter not knowing what was coming next translated Special as UNUSUAL, UNCOMMON or PARTICULAR, and thus losing the effect that McGlynn wanted to achieve). Have a Happy New Year and lets meet at some of the exciting musical events lined up for Tsukuba next year!